Ride Leaders - ensure you post any late changes to your ride on the Fleet Cycling Facebook Page as this feeds directly to the Ride Updates page on the website and can then be seen by all members with internet access. If time permits contact either Colin or Andrew P to update the website Rides Calendar. There is also a Fleet Cycling What's App group that allows riders to share road conditions before the ride in near real time. This often informs our decision on whether to delay or cancel a ride. If you require access to the What's App group please contact Colin Waters from the ride leader page. The ride leader should be well organised, supportive and present him or herself in a way that shows the club is not negligent in its approach to safety and quality issues; be positive so that guests are encouraged to join either of our groups. The ride leader has a duty of care towards the riders and must ensure as far as reasonably practicable that the safety and enjoyment of all participants and the public has been taken into account in the organisation of the ride. As ride leader you have no specific authority over the group, although the Rides Secretary must be certain that the members selected to be ride leaders can carry out the requirements in this guide to the expected standard. New Ride Leaders - the skills and qualities that a ride leader must possess are a knowledge of the group and members, familiarity with the roads and lanes around Fleet, the skill to assess potential hazards and the respect of his or her peers. A new ride leader will usually lead their first ride under the tutelage of an experienced ride leader who will report comments to the Rides Secretary, who will ensure a rider leader self declaration is completed (click here to down a copy of the form) and that a proposer and seconder (who must both be members of the committee) support the appointment. 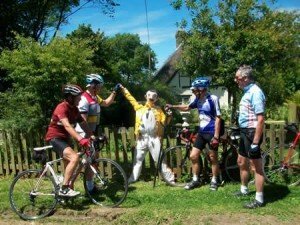 In the photo below a group of Fleet Cycling riders are electing a new ride leader and chairman, who is wearing the yellow jersey! For our regular club rides Cycling UK does not require a specific risk assessment because regular club rides in our normal district have a good safety record. This safety record relies on the experience and common sense of our ride leaders who are able to assess the terrain and traffic and make appropriate judgements as the ride progresses. The rider leader should have a specific route in mind before the ride starts and should have considered the known potential hazards and the likely weather coditions in relation to the level of experience for the expected participants. If new or inexperienced riders turn up then the ride leader should consider whether the planned route needs to be modified. 'Known hazards' are such features as steep or winding descents, main or busy roads or crossings and the state of trails or lanes. These can be made safer by communicating with riders before reaching a feature and asking them to take appropriate caution. A key consideration is the weather forecast; the ride leader should consider whether the planned route should be modified especially in wet or icy conditions. If there are severe weather warnings in place then the ride leader should consider, in dialogue with the Rides Secretary, whether the ride should be cancelled. Such a decision should be communicated to the membership via Facebook Page, What's App and the Website (ask Andrew P, Saty M or Colin W). The ride leader should check that the refreshment stops will be open and for pub lunches the ride leader should make a reservation for the likely number of participants - some pubs will request confirmation of numbers on the day of the ride. This guidance on the Cycling UK website is well worth reading and new riders might find it useful as well. Welcome new riders and introduce yourself and tell them about the ride. Ensure all riders are carrying emergency contact details. Some new riders will have a Guest Rider form already completed - if not give them a form and ask them to complete it. Send completed forms to the Registration Officer, i.e. membership@fleetcycling.org.uk! If a new rider completed the form on an earlier ride they do not need to complete another form. Children must have a parental consent form signed by their parent or guardian if they are unaccompanied. Children under 13 years must be accompanied by a responsible adult who must supervise them on the ride (if this adult is not their parent or guardian then they must have a signed parental consent form). Appoint a "buddy" to new riders not just for safety but also to ensure they are included in the ride and introduced to other riders. Appoint a "back marker" to accompany the last rider and to wait with them if they stop. At junctions check that you can see the back marker. If the group is larger than, say 7 riders, consider consider splitting the group into 4 or 5 riders, particularly, on busier roads, so traffic can move past the groups. Appoint a leader for each sub-group. Stopping - choose a safe place to stop the group and get everyone off of the carriageway. Enforced stops - assess the problem and if necessary move the bulk of the group to a safe place and consider whether to hold up the ride or leave a small group behind with details of the route to the next stop. As ride leader communicate your standards of behaviour by dealing with hazards, junctions, potholes, vehicles, passing traffic, narrow roads, dangerous descents, passing horses, etc. Make sure knowledge of hazards is passed quickly back through the group. If riders have an unsafe technique or equipment then speak to them and ask them to conform to the behaviour of the group. If you leave the front of the group make sure that the lead riders do not separate from the rest of the group by asking them to remain in contact. If a rider says they will leave the group, then establish the reasons and consider whether to alter the ride to accomodate their needs or appoint an experienced rider to stay with them. Irate motorists - encourage all riders not to engage in bad behaviour to motorists even when provoked by poor behaviour or abuse by the motorist. When motorists behave well and wait behind or stop to let the group pass then make sure that you thank them. Send a report on the ride with number of riders preesent together with names of all guest riders to the Rides Secretary. If the guest rider has filled in the disclaimer form on their first ride send the form to the Registration Officer - a scanned copy is fine. If any incidents occurred on the ride then complete an Incident Report. A copy of the latest form is available from the Cycling UK website (other useful resources on this page) and details of how to process the form are detailed on the form; send your form to the Secretary with a copy to the Rides Secretary. The Secretary will send the form to Cycling UK.